H. H. ASQUITH Photograph SIGNED. British Liberal Prime Minister (1908-1916). Photograph Signed (as Earl of Oxford). A nice image of an urbane looking Asquith by R. Haines, taken towards the end of his long and illustrious political career. The portrait is a real photo post-card by Beagles. Asquith has signed as "Oxford" over his printed name in the lower white border. Asquith was a successful peace-time Prime Minister and, until Margaret Thatcher, was the longest continuously serving Prime Minister of the 20th Century. He was however seen as a hesitant and uncertain leader in time of war. 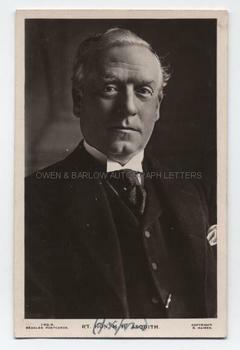 He was ultimately exhausted by the pressures of politics and after being raised to the peerage in 1925 as the Earl of Oxford, he died only three years later, making his autograph as "Oxford" somewhat rare.